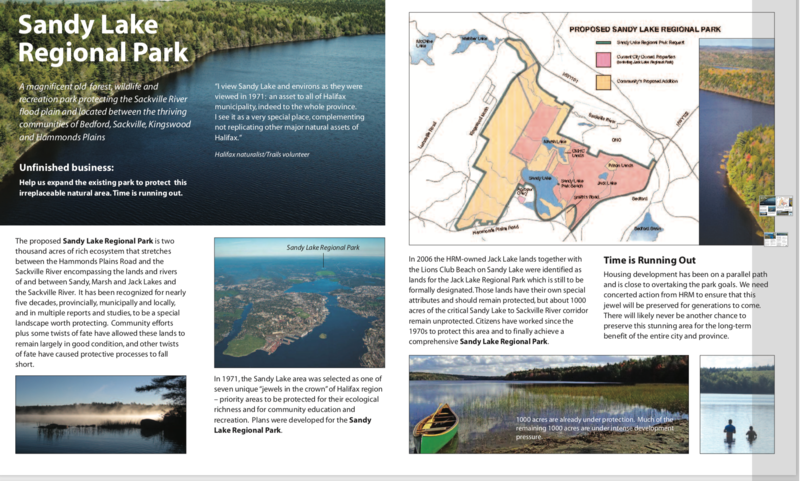 The proposed Sandy Lake Regional Park encompasses 2000 acres in total, with 1000 acres already under protection. Much of the remaining 1000 acres are under intense development pressure. This rich ecosystem stretches between the Hammonds Plains Road and the Sackville River encompassing the lands and rivers of and between Sandy, Marsh and Jack Lakes and the Sackville River. It has been recognized for nearly five decades, provincially, municipally and locally, and in multiple reports and studies, to be a special landscape worth protecting. Community efforts plus some twists of fate have allowed these lands to remain largely in good condition, and other twists of fate have caused protective processes to fall short. 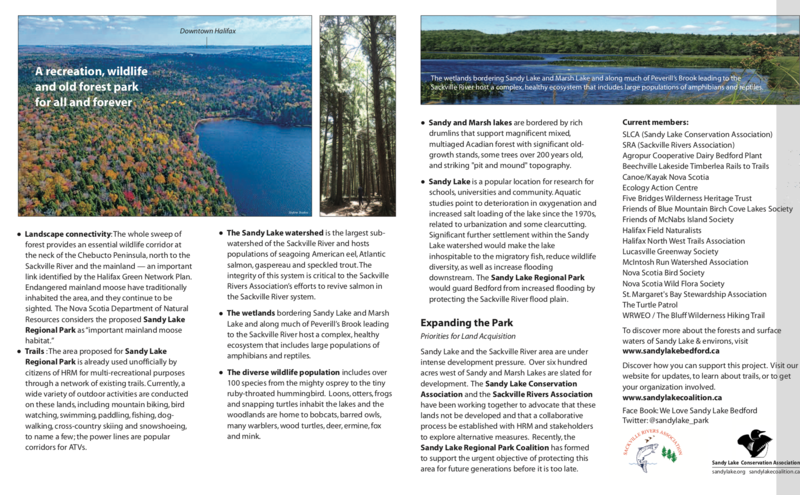 In 2006, the Jack Lake lands were acquired, and together with the Lions Club beach on Sandy Lake, designated as the Jack Lake Regional Park. Those lands have their own special attributes but about 1000 acres of the Sandy Lake to Sackville River corridor is still unprotected. The completion of Sandy Lake Regional Park is unfinished business. 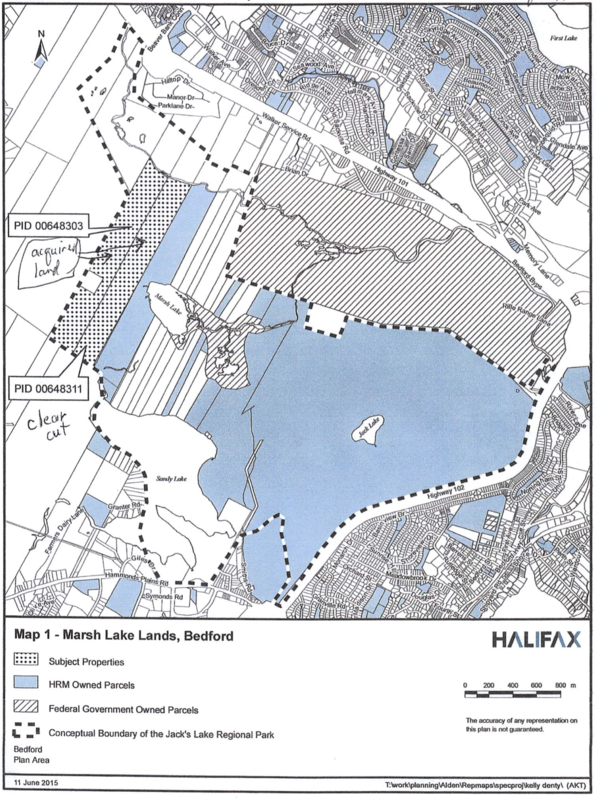 In 2015 the city acquired 160 acres west of Marsh Lake from the developer who had carried out the 200 acre clear cut of 2013. Once again, community and the municipality was working together to further the goal to protect this “gem”.